I'm wondering if my dough isn't proofed enough and if my banneton is too small. This banneton is 25x15x8cm (9.8x5.9x3.1"). The dough is 100g starter, 500g flour, 400g water and 10g salt. Even though I made sure the bowl was in a warm place all the time, it didn't fill up the banneton as much as I'd think it should. This has been a bit typical during winter, but I was hoping it would work better when kept in the bathroom. This may partly be because I used a lot of coarse spelt. Is this banneton too small for the dough size I'm making? I like the banneton size since the dough fits perfectly in the Lodge Combo. Should the dough have more volume at this point? The photo is taken at the moment I put it in the fridge, 6 hours after the first mix. 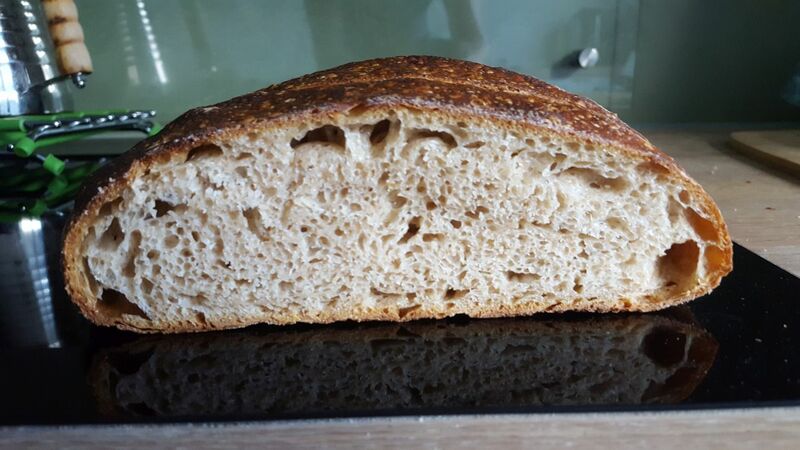 100g starter (100% hydration 50/50 white and coarse spelt), 400g water (30C), 50g fine spelt, 150g coarse spelt, 300g white wheat, 10g salt. Starter used at peak. Mix everything but salt. Wait 60 minutes. Spread salt over dough and pinch in until it firms up. S&F every 30 minutes for 2 hours total. Dough onto benchtop, pre-shape, flip onto seam. Wait 20 minutes. Dough had flattened quite a lot by now. I flipped it again, shaped it and put in the banneton. Wait 90 minutes. Put into fridge for 12-36 hours. The bowl and banneton was kept in the bathroom all day, with around 25.5C ambient temperature. How cold is your refrigerator? Im getting confused, there are several posts using practically the same recipe and having problems. Maybe you guys should get together with your 82% hydration dough and compare notes. More worried about the dough sticking to the banneton liner, is this a special cloth using little or no flour? It has an interesting sheen. The banneton looks like it should work. 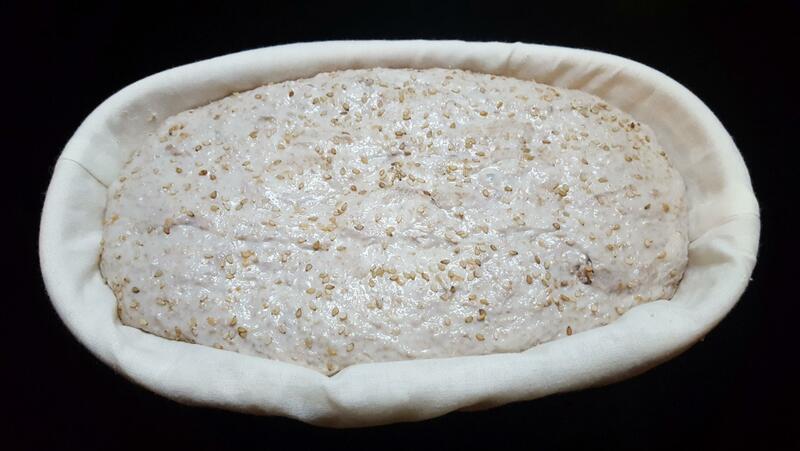 Spelt should be baked early before it proofs too high as it tends to add quite a bit of stretch to the dough. 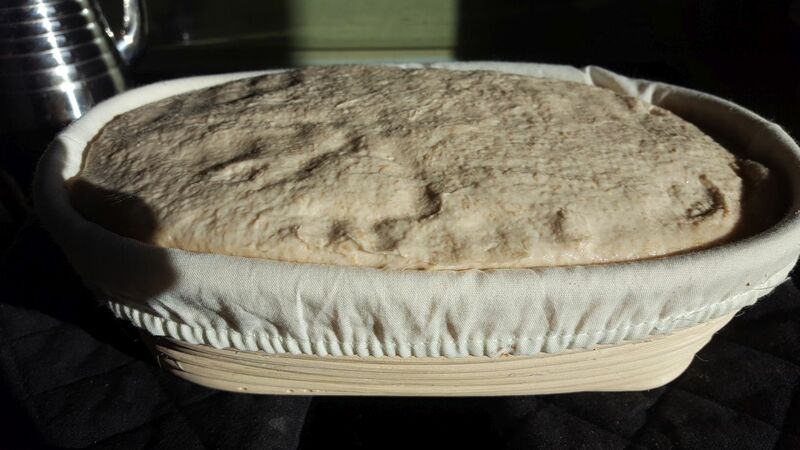 How does this picture of volume compare to the shaped dough when it first went into the banneton? The fridge is 0-3 celsius and any sourdough activity pretty much comes to a halt when I put it in there. I'll check out that other topic, thanks. The liner came with the banneton and I suppose there's linen or something in it. Even the wet doughs come out of it pretty easy without any flour when I bake it straight from the fridge. I don't think this dough was the best example because of the coarse spelt. I've had doughs in it before where it protruded a bit over the top. Here's a photo. This is not the same banneton, but the size is not too different. Does this look like a dough that's too large for the banneton? The dough rose a bit more in the banneton, but not a lot. I was under the impression that keeping the dough confined was the aim of a banneton - otherwise, wouldn't you just turn it out onto the counter, instead of using a container? That's what I was wondering. 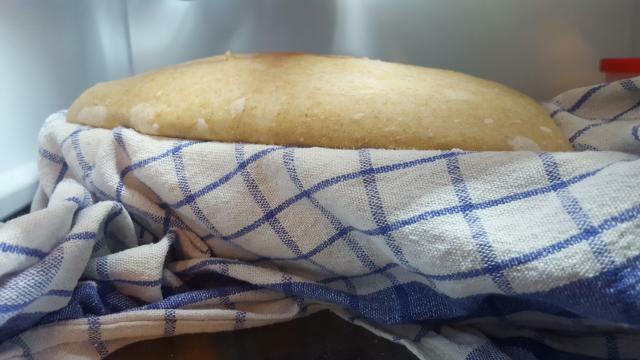 How far can the dough protrude over the top of the banneton without it affecting the loaf negatively? 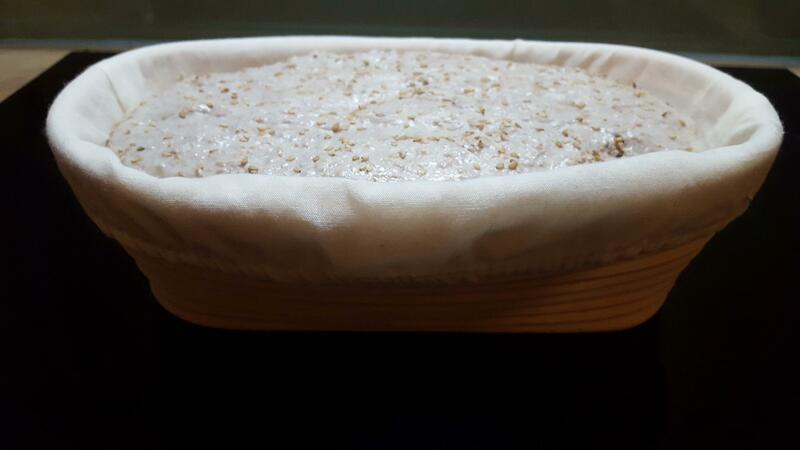 Of course if it overflows I get it, but if it rise up like in the photo I posted above, would the result be better if the banneton was an inch taller and the dough didn't stick up like that and sag a bit out onto the top of the banneton? ...has happened before - have you been happy with the actual bread? Yeah, it happened more often in the summer. I think I was happy with it, but never quite sure if the dough was at an ideal stage in the proof or not. 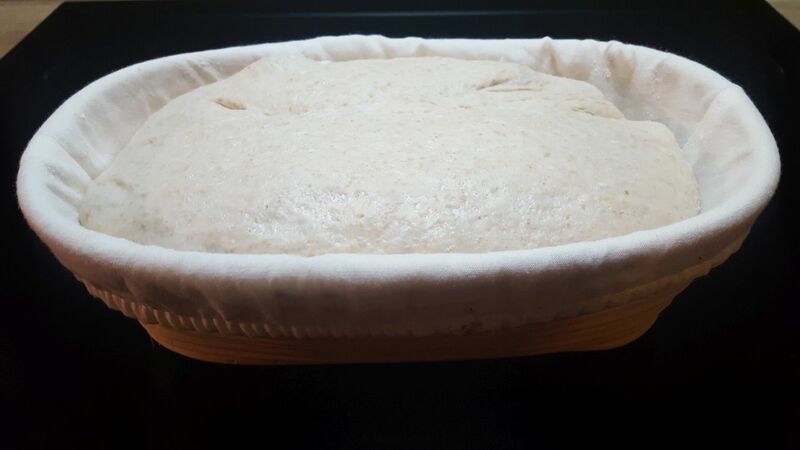 I also don't know if the dough holds it's shape in any worse way when the dough starts protruding more over the banneton edge and sometimes sag a bit onto the top edge. 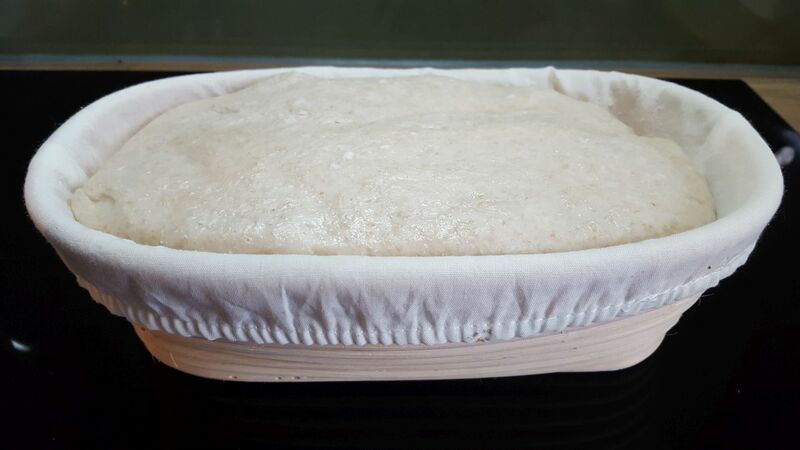 My general rule when proofing doughs in brotforms or bannetons is to put them in the oven when their peak reaches the level of the rim and no (or barely) higher. The image you show above is substantially over-fermented, in my experience, and would be expected to pancake dramatically in the oven and not have much oven spring potential. I prefer to err on the side of under-fermentation than over-. I (and others, I assume) try to adjust the amount of dough so that "to the top" is a good gauge of final proof completion. That's the thing. If I didn't consider it overfermented, this could be a result of the banneton being too small or dough too large. Say if a description of the banneton said it fit for 500 or 750g doughs and I put a 1000g dough in it. I suppose the volume/weight relationship of a dough changes depending on what flour you use and the amounts. Is there a way to calculate this to compare with the volume of the banneton? I can't say I know how to identify the best spot in the final proof of a dough, which makes it bit difficult to adjust the dough based on this. How about putting a rolled towel nest around the top. Got a piece of tubing or thick rope you can slip under the banneton cloth to add another coil or two to keep it rising straight up? I can imagine a large dishtowel square (think baby transported by a stork) swinging from a cupboard knob with the filled banneton inside. Or invert another banneton the same rim size over the top. Now go out and find a bigger banneton. At least a taller one for 1000g dough. I playing around with the sizes using inside measurements. Oval. 28 x 13 x 7 = 2548. 28 x 13 = 364. Thrown in for comparison. Tissue box. 23 x 11.5 x 8 = 2116. 23 x 11.5 = 265. (Temporary solution? Slightly bigger than oval banneton. Could carefully lift dough from cane basket and let finish proofing in an empty paper tissue box with the top removed, a tissue box cover would be closer to 25cm long and stronger.). Can I talk you into a 23 x 13 bread tin? So much easier. If dough is not firm enough to rise straight up and wilts over the edge, I'd be checking into the dough strength, perhaps the dough was shaped too early Into fermentation. Oh yes, there is that high hydration factor. Enter the "grey zone" where more than one parameter has been pushed to the limit. A reshape might be in order. There are a few ways to solve it if the banneton is in fact too small. 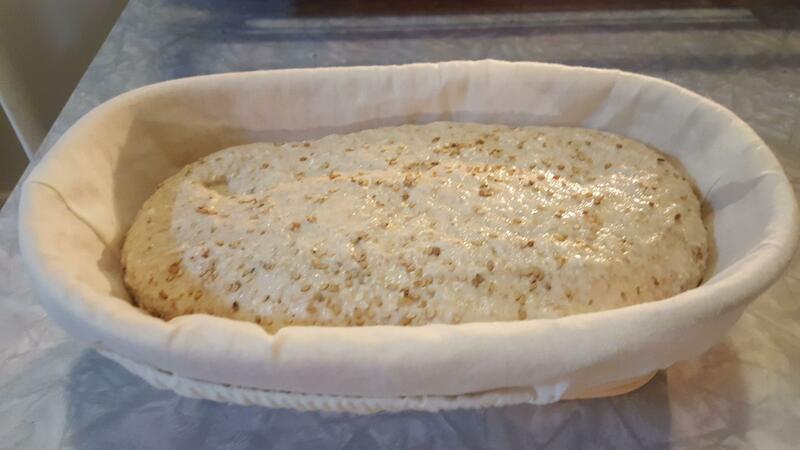 The first goal was to figure out if the banneton was too small or if my doughs were overfermented. I'll see if I can find a banneton with the same length, but taller. If not, maybe use some of your suggestions or just make smaller doughs. I already got a larger round one that fits a 1000g dough, but I prefer batards. A bread tin might do a good job. I got a few already, but they are too long and not tall enough. Maybe I can find a taller tin than banneton. There are certainly areas to improve in the making of the dough, but I'm using the same method as I've done before. Maybe that was in summer and the warmer weather helped. What I can tell from the doughs is that they don't fill up the banneton as much as before and the last ones have been quite sticky. I think I'll dial down the water a bit for now. 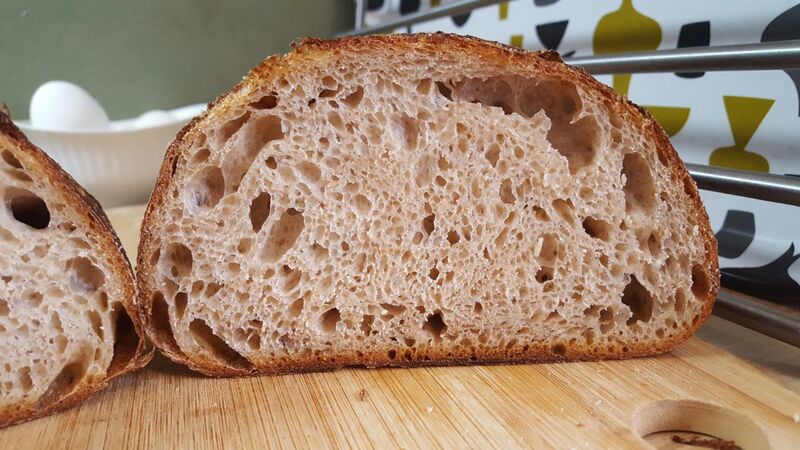 My doughs are usually 30-50% wholemeal, which is one reason why I like the higher hydration. 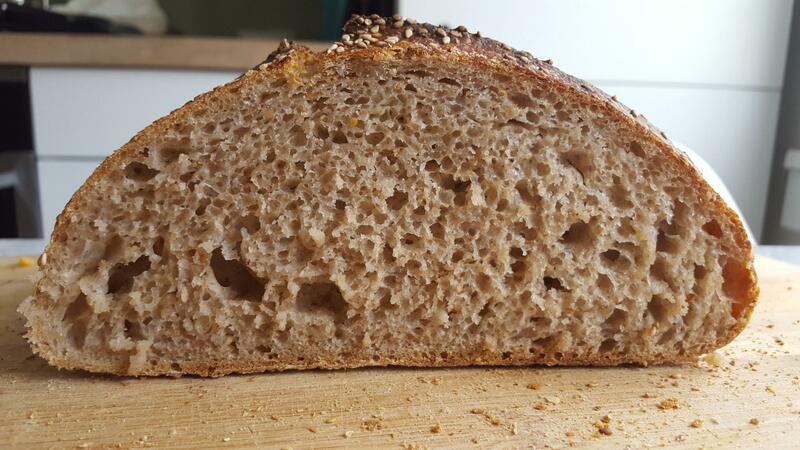 I've been using a few different flours, but I'll stick to wheat and wholemeal wheat for a while. Doughs with spelt or rye has a tendency to get very sticky. Made a loaf yesterday and got a new one in the making now. The one from yesterday wasn't too successful. Dough was pretty sticky and it doesn't feel like it builds up structure. It's more like I stretch and fold, it tightens up, then it's back to where it was 30-60 minutes later. My doughs from earlier got more of a structure and were tighter with each stretch and fold session. I'm not getting much oven spring either now. The starter doubles when I feed it. 1:2:2 in 23-24C and it peaks after 6-7 hours. I also use it in my pizza where it seems to work well. I have wondered if it's become too acidic. Is there a way to test this? The dough I got in the works now is made according to Trevor's method with the overnight soak. I reduced the hydration to 75%, but it's still somewhat sticky today. I've made with 85% HR before without too much trouble. The flour may be the cause of that since it's got a bit rye and some different stuff in there. There is a fairly wide range of acidity that is still good - you don't have to hit a target - you only need to be within the general range. It was pretty good. 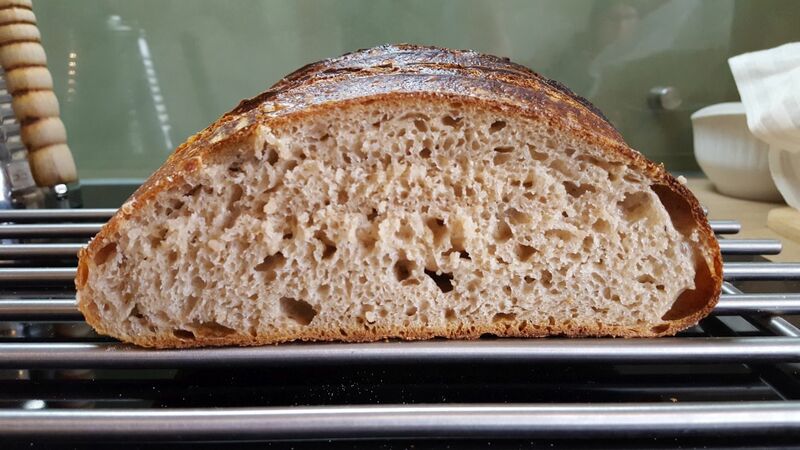 Very moist and soft crumb. Didn't have much structure to speak of, but that's the nice thing about sourdough bread. Even if they don't come out as I'd hoped, they always taste good. I realize that I may have been starving my starter for some time and maybe not treating it as well as I should have. Been taking breaks from baking for a few months, not feeding it as often, forgetting how I used to feed it. Recently my usual procedure has been to keep it in the fridge most of the time, take it out 4-12 hours before I need it, feed it and use it once it's peaked. Sometimes it has gone a bit too long past peak and fallen again. Then I use what I need and put it back in the fridge. I've been reading a few posts about starter management, more than a few with great contributions from you, Mini Oven, and see that I should feed it before putting it back in the fridge. Maybe let it sit out a few hours too. I went to a bakery (Ille Brød) in the city today where I bought a bread and got 30g of their starter. This is one of the best bakeries in Oslo and my methods has pretty much been based on their book. They use a wholemeal fine swidden rye and oland white wheat 50/50 mix in their starter. I look forward to trying it out and see how it behaves compared to my own. Yup, I sometimes take my own advice too. :). Sounds like a plan. First of all, make no mistanke and think I'm disappointed with this loaf. It tasted great and all will be eaten. :) I'm optimizing and seeing how good of a loaf I can make. 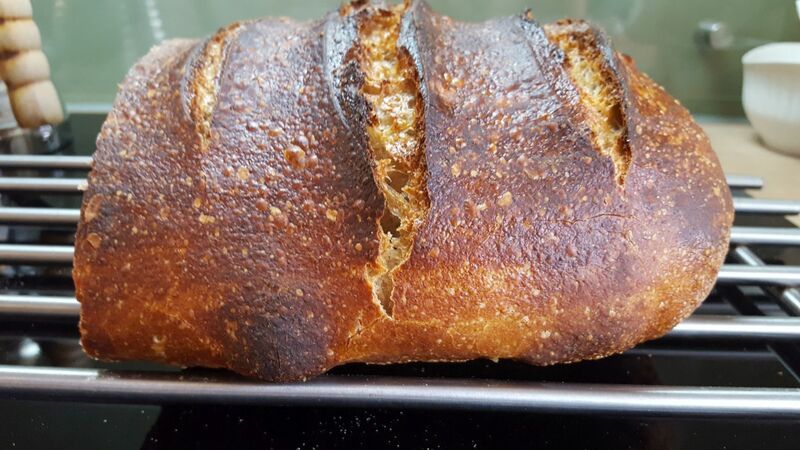 I also want to push the amount of WW higher and use different kinds of flour with worse baking properties and it would help if I had the rest of the process working well by then. I'm a bit puzzled about everything and wonder where I'm not getting it right. I'm putting a 1000g dough in a banneton "made for" 500-600g doughs and the dough looks to fill the banneton about the same amount as others fill it with their 600-650g doughs. I expected the dough to be underproofed, but it also didn't get much oven spring, which I thought was more of an overproofed thing. I've made 50% WW loaves with spelt that got more lift than this one before. It was left in the bathroom where I expect it is 24-25C all the time. Maybe it's the winter dry air. Next time I think I'll try making a 600g dough and spending more time in bulk. I don't know if I should extend the final proof more than 1-2 hours, but spend that time in bulk and create more tension with S&Fs. First photo before final proof, second photo after final proof, before fridge. the ww flour? As you raise the %, it may become more important to do so. That's something I plan to do more. I've read Trevor's recipe where he soaks it overnight and a few comments in here suggesting that's maybe too long. How long would you recommend I soak it? And do I soak with proportionate amounts of water relative to the hydration to the dough or more? If I make a 75% HR dough, so I soak 200g WW with 150g water or more? Still trying to figure this one out. I've now switched to my own starter to see if that makes a difference. So far I can't say it makes any noticeable difference on the activity in the dough. The dough has handled very nicely though. I made a 700g loaf and two 1000g ones. 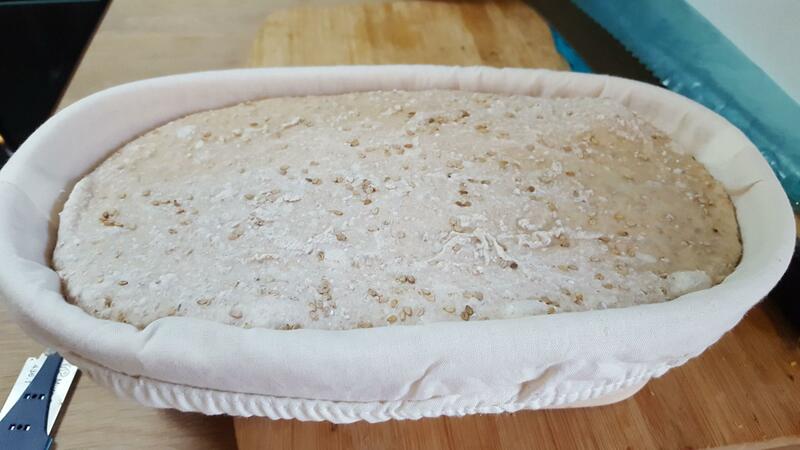 My own starter is only on white wheat and maybe the small amount of rye in the other starter is enough to make the dough sticky. That, or I'm just doing things a bit different now. I'm doing 1-2 hours autolyse with just flour and water, and on the last loaf I did the Rubaud method for 15 minutes total after adding starter and salt. The first 1000g was no success. Autolysed the WW, bulked for 4.5 hours and proofed 2 hours. The dough didn't have much tension and flattend in the banneton. Filled the banneton out somewhat, but very poor oven spring. IIRC, this dough was sticky and I wasn't able to build much tension in it. The 700g went a bit better. Not exactly sure about the process, but I think I tried shortening everything a bit since I wondered if the previous one had overproofed. 3-4 hours bulk and 1 hour proof maybe. Held it's shape pretty well, but irregular crumb and not very proofy. The last 1000g handled very nicely through the entire process. I've started using a glass bowl both since the dough sticks less in it and to hopefully be able to see somewhat how much it has increased in volume. 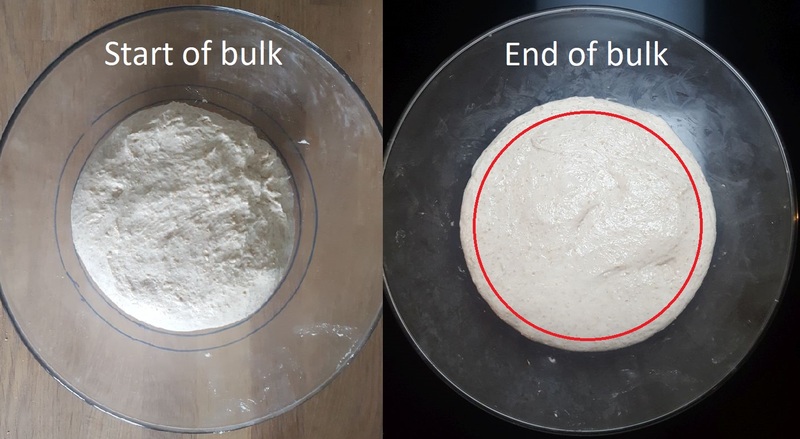 I drew two lines on the bowl and took a photo at the beginning of bulk (after 1 hour autolyse and 30 minutes Rubaud) and another at the end of 6 hours bulk. Preshape, shape and I let it proof 1.5 hours before putting in the fridge. Still don't get much volume in the dough. 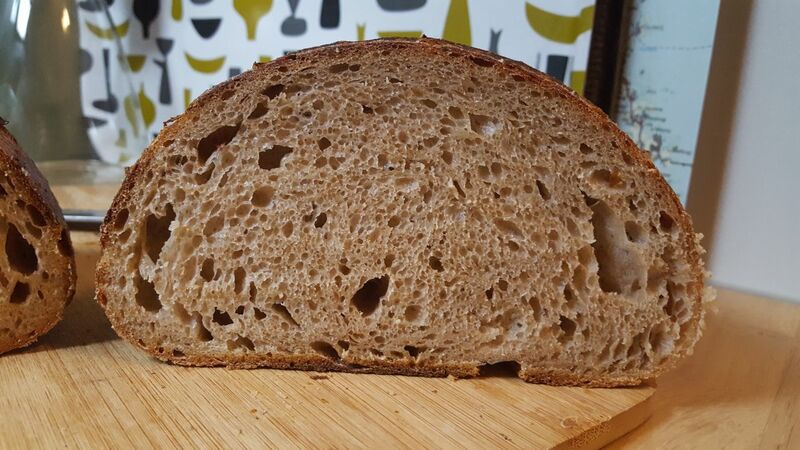 This one also held it's form pretty well during bake, but the crumb is very dense and irregular. The larger holes at the top might have to do with my shaping technique. I measured the volume of those two levels after I was done with bulk and got 470g and 780g of water. The photos are from a bit different angles and it's not too easy to judge volume like this, but I can try to make an estimation. The change in volume is ca. 66% if the dough had gone from the lower line to the upper. It might have been a bit over on the beginning and under at the end, so maybe I can say it's within 30-50% volume increase, which is what I'm going for. How much volume increase do I want to see from initial mix to it's done proofing? 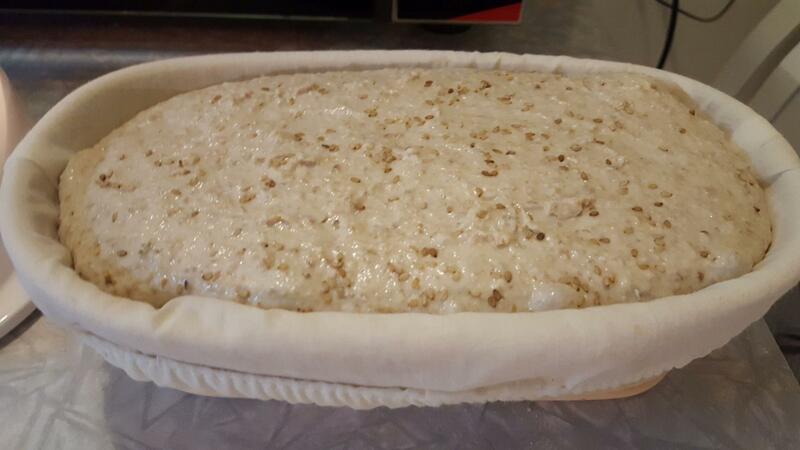 If I get 30-50% during bulk, how much do I want it to go in final proof before putting it in the fridge? I tried the finger poke test on the dough before putting in the fridge, and based on that, I shouldn't want to let it go much further. The indentation came a bit back, but not completely. 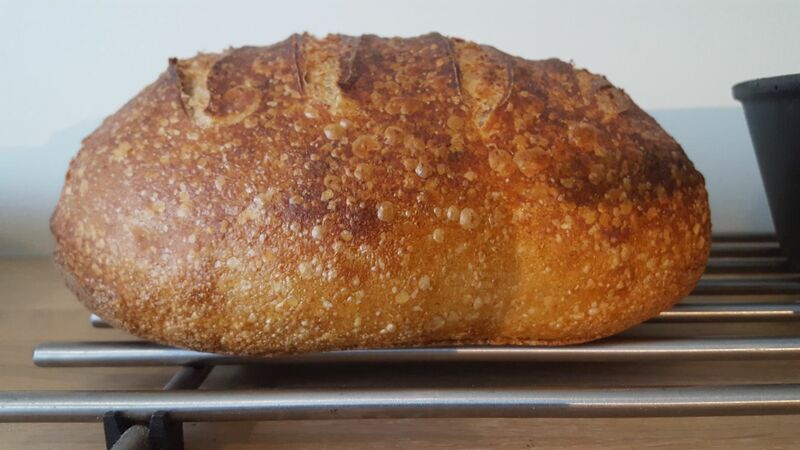 I've been thinking underproofed since the doughs are so small when I put them in the fridge, but lack of oven spring is often more an overproofed issue. 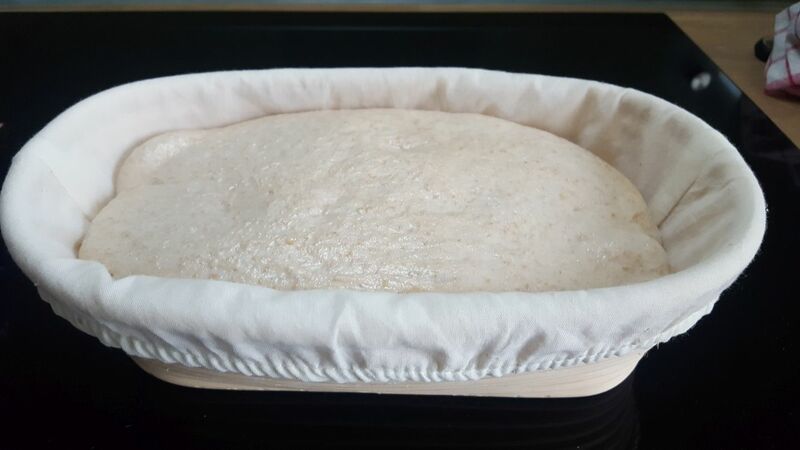 I'm a bit scared to proof longer in fear of the dough sagging out and losing tension, and various guides I've seen suggest 1-2 hours, but maybe with a properly developed and tight dough it might work to go longer. I'm trying to go for 30-50% increase during bulk (Trevor's advice), so maybe I just have to final proof longer or at a higher temp to get the volume. For the dough to fill out the banneton, if it only increase 30-50% during bulk, it has a lot of work to do during the final proof. Fridge is 2-3C btw. Any sourdough I put in there pretty much comes to a complete halt. I can leave a dough in there for days and nothing happens. I'm learning a lot through this process. Watching the dough and not the clock probably being the most important one. With more time I started finding volume during bulk. The next challenge was final proof. The doughs are usually not very proofy by the time I start final proof and I got the options to either let it proof longer, but usually end up with a dough lacking tension, or proof it shorter and get a smaller, but better shaped loaf. Dough handling is surely a factor in this. Especially preshape and shape needs improvement. What I don't get yet is how much the dough should increase during final proof. I've started to watch the dough more and look for signs of the development. They have been quite wet, so I should try to avoid the higher hydration ones for now. If the doughs should handle 1-3 hours final proof, they definitely need to have more tension than today. Not that I think they overproof as much as losing tension and becoming too relaxed during that time. That's one reason I wanted to get around 50% during bulk so less time is needed in final proof. 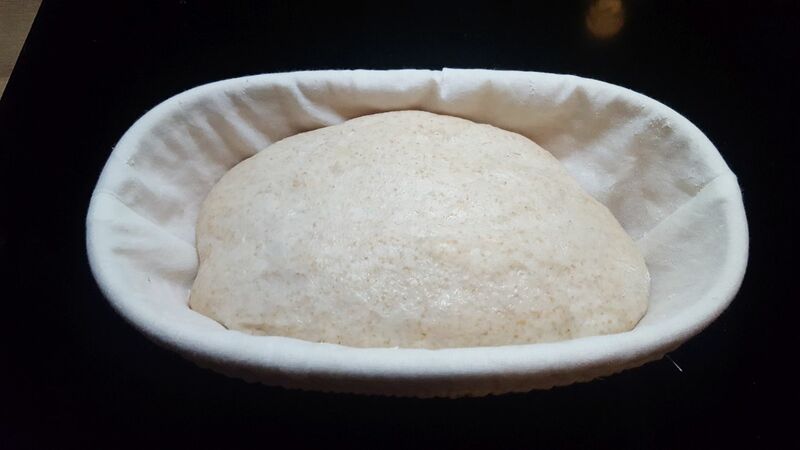 The dough becomes a bit compact during shaping and looks to need quite some time to build volume again. I'm currently sticking to the 700g doughs with 3/2 ratio between white and wholemeal.